A hashtag began circulating, #FindMax, and the tweet was shared thousands of times. 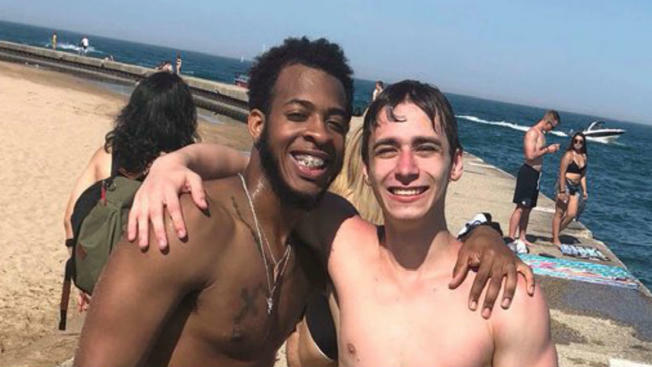 A man used Twitter to track down the stranger who saved him from drowning at North Avenue Beach on Memorial Day when he was overwhelmed by the frigid waters of Lake Michigan. Until Thursday morning, D'Marié O'Connor only knew his rescuer's first name and had a photo they snapped together before parting ways. He decided to share the photo on Twitter in an attempt to track down the beachgoer who saved him for a more thorough thank you. The 24-year-old was enjoying the warm weather Monday with his friends at the lake after working a shift as a certified nurse’s assistant. He was drinking with his buddies, like so many other Chicagoans during the long weekend. He heard his favorite song “Boo’d Up” by Ella Mai and got a little too excited, he said. “I was feeling it too hard,” before he flipped off a concrete breakwater into the lake, he said. He knows how to swim, he explained, and is even CPR certified. But he hadn’t been paying attention to where other people were getting out of the water—a ladder a ways down from where he jumped. The water was 58 degrees and O’Conner quickly realized he was in trouble. “I started panicking,” he said. The barrier wall he needed to scale was nearly 10 feet high from the water’s surface and he only slipped back into the lake with each attempt to get out. He could hear his friends laughing as they Snapchatted themselves by the water’s edge, oblivious to the danger he was in. “I’m literally sinking and I can hear my friends just casually on the snap recording my death,” he said. O’Connor mustered one last effort to scream for help before he went under again. The first-name-only hero pulled the breathless O’Connor from the water. After catching his breath and regaining his composure, O’Connor asked his rescuer for a name and took a photo with him before the two parted ways. But the next Day O’Connor decided he needed to reconnect with Max and tweeted the photo with a plea for help to find him. “Retweet until I find Max’s twitter so I can buy him a drink,” O’Connor wrote on the social media site. A hashtag began circulating, #FindMax, and the tweet was shared thousands of times by Thursday morning. A friend of Max Canfield's saw the photo and connected the two on Twitter. Efforts to reach Canfield for comment were unsuccessful Thursday—but O’Connor says the two are planning to get brunch together soon. The response on Twitter to O’Connor’s story seems overwhelmingly positive. “Glad you’re ok. Max is dope for that,” one user tweeted. “Wow...to see something positive on twitter! Amazing ...good on you guys!” another said. O’Connor was pleased to share his story and heaped praise on Canfield for saving him. “I feel like it’s a positive story,” he said.